Conveniently located within Padma Resort Ubud, on the edge of a breathtaking river valley, The Pool Café and Bar welcomes you to paradise. 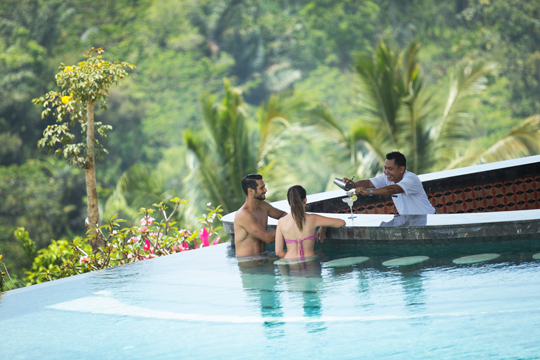 Connected to the resort via an enchanting glass-top tunnel, the infinity swimming pool offers breath-taking views and the refreshing mountain air of Ubud. Measuring a remarkable 89m long and 7m wide, the water is cool during the day to provide an invigorating oasis on warm afternoons, and is heated when the temperature drops to allow for comfortable morning and evening swims. A stylish pool deck is appointed with comfortable sun loungers and umbrellas to provide countless hours of relaxation. The Pool Café & Bar is the perfect place to indulge in a fresh fruit smoothie or signature cocktail with friends and family. Marvel at the view, let off some steam and create memories that will last forever at The Pool Café and Bar, one of Ubud’s most captivating destinations for your well-deserved rest and relaxation.